Base Layer: Stay warm in cool weather and stay cool in warm weather: wear our base-layer top and bottom to regulate your temperature and manage moisture against your skin. Mid Layer: Need more warmth? Add more insulation with our lightweight jacket protecting you against the cold by trapping air close to your body. Outer Layer: Ride no matter what the season, what the elements, whether you’re racking up the miles touring or navigating city streets. 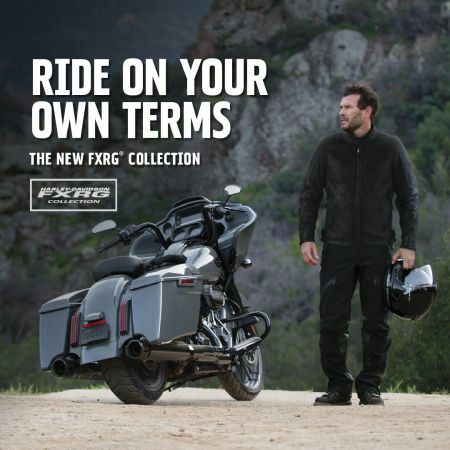 Our FXRG® riding jackets are constructed with the most advanced technologies and materials to keep you on the road, even in the harshest temperatures. Add layers to stay warm or to cool down. For more information on the FXRG® layering system, check out the video below. Visit us in-store and our friendly team will fit you out to suit your riding style!